I couldn't resist the play on Mr. Darcy from Pride and Prejudice on the cover. On the eve of her first comic book release, Ella Briley has a problem: no date to the launch party. Things go from bad to worse when she stumbles into the past . . . and straight into the arms of her very own Mr. Darcy. Patrick St. John, Earl of Meadowfair, is too noble for his own good. To save his friend from what is sure to be a loveless marriage, he's agreed to whisk the girl off to wed the man she truly loves. But all goes awry when Patrick mistakes Ella for the would-be bride . . . and finds this modern girl far too tempting for even the noblest of men to resist. I should have known better than to pick up a book that involves time travel and historical romance, because... it really just has not worked for me lately. Kiss the Earl takes a modern comic book illustrator and drops her, very much due to some unwelcome meddling, in the past. Now, I haven't read the previous two books in the series and it was made clear that Ella had previous experience with time travel, though she'd semi-written it off as a figment of her imagination. Regardless, she seems to acclimate to the experience fairly quickly, accepting it all in stride - though I suppose what choice did she really have? I think that being part of a series titled Geek Girls made me have higher expectations about how geeky Ella would be. In the modern world, she was portrayed as being fairly isolated, and focusing entirely on her work on comics. I didn't find that she really came across as particularly geeky while she was in Patrick's world. Now, maybe there was a lack of opportunity, but I was still disappointed. I really want to read a book featuring a geeky heroine that I can be fully invested in, and totally satisfied by: any recommendations? The romance itself bothered me in that some of the conflict is a bit manufactured by a lie that Patrick permits Ella to believe. These two go a bit over the top when it comes to protecting each other's hearts and such, and I really wanted to sit them both down to have a honest, heart-to-heart conversation. The resolution is very tidy, which is, I think, fitting for the overall tone of the story. 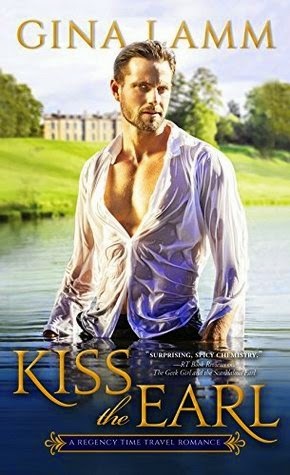 Kiss the Earl does address some really significant problems a modern woman could face if she time travelled to the nineteenth century, but I still felt that Ella had really odd priorities - mostly around helping out Patrick rather than addressing her own situation. Kiss the Earl didn't really do it for me - I found the romance was lacking something for me, and the story came together in a way that was too convenient. Plus, my dislike for meddling matchmakers is well-documented (in other reviews), and I was especially put off by the meddling in this book because time travelling to the past seems rather dangerous! !